With September looming just a few pages ahead on the calendar, I have been keeping an eye on the skies. For the most part, I focus on the trees and feeders during the migration season, but I also make sure I look up from time to time. The reason? Well, that’s the best way to detect flocks of migrating Common Nighthawks. A Common Nighthawk finds a perch for a brief rest. So, what is a Common Nighthawk? First, this bird, despite what is implied by its name, is not a hawk. It’s also not strictly nocturnal. My observation of this particular Common Nighthawk completed my tally of the members of the nightjar family found in the region during the summer months. The nightjar family is represented by three species of birds — Common Nighthawk, Whip-poor-will and Chuck-will’s-widow in Northeast Tennessee. Readers may recall from earlier columns that I have already heard Whip-poor-wills and Chuck-will’s-widows this year. Each fall, Common Nighthawks form large flocks, ranging in size from dozens to hundreds or even thousands of individuals, as they migrate south for the winter. 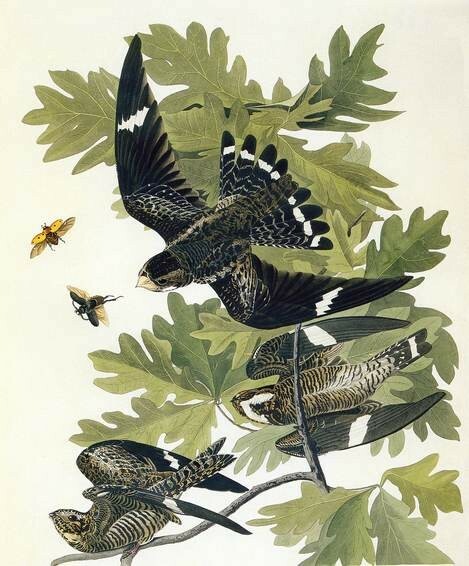 Painting by early American naturalist John James Audubon of Common Nighthawks. 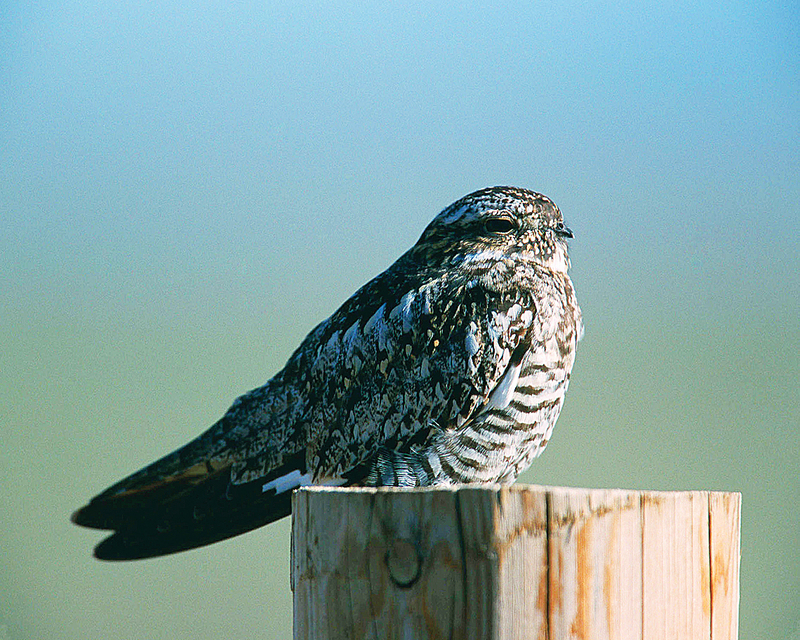 The Whip-poor-will, after the Common Nighthawk, is the second most widespread member of its family to spend its breeding season in North America. The Whip-poor-will ranges from southern Canada to the Gulf states. The Whip-poor-will also occurs in Arizona, New Mexico and southwestern Texas. The Whip-poor-will favors habitat consisting of deciduous woodlands and the edges of forests. Whip-poor-will numbers have apparently been declining in the past few decades. These nocturnal birds frequent woodland edges, but they seem to be rather particular about such habitats. A forest that is too mature seems to hold little interest for them. Disturbed habitats, such as those created by logging, are acceptable to the birds once secondary growth begins. As this new growth matures, however, the Whip-poor-will apparently abandons such territory. Because of these requirements, Whip-poor-wills can be somewhat localized in their distribution and sometimes difficult to locate. When I was a kid one of my favorite summer activities was sitting on the front porch of my grandparents’ home on Simerly Creek Road and listening to the Whip-poor-wills call after dark. I remember how the plaintive call would be repeated for long intervals before a passing automobile’s headlights might frighten the bird into silence for a short while. Then, tentatively, the calls would renew. Today, I’m living in my grandparents’ old home and the Whip-poor-wills no longer call. Well, there was a single individual that called for a single evening back in May of 1997, but that was apparently a migrating bird that did not remain in the surrounding woodlands. The only member of the nightjar family that I dependably encounter at home on Simerly Creek Road these days is the Common Nighthawk, and then only during that narrow window of late summer and early autumn. 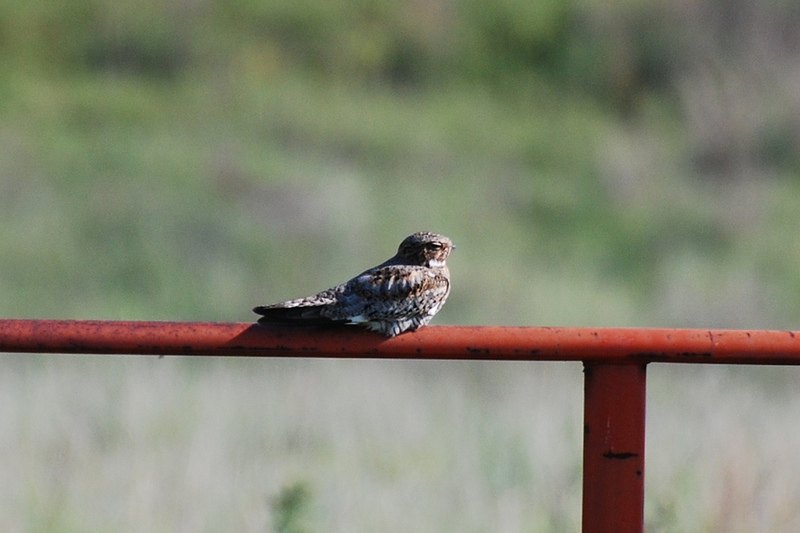 Photo Courtesy of Jean Potter A Common Nighthawk rests on a metal railing. So, keep looking skyward. The next flock of migrating Common Nighthawks may fly over your home. These flocks are usually on the move from mid-August to mid-September. Unlike Whips and Chucks, the Common Nighthawk does fly only at night, which makes it much easier to observe these birds. They look somewhat like swifts and swallows but are much larger. They are brownish-gray birds with pointed wings and forked tails. They are easily identified by distinctive white patches on the underside of their wings. The nightjar, or Caprimulgidae, family of birds is also sometimes known as “goatsuckers.” There are almost 80 species of nightjars in the world. Less than 10 occur in North America. The Common Nighthawk, Whip-poor-will and the Chuck-will’s widow are neotropical migrants. While they breed in a wide range of territory in North America, they spend their winters in Central and South America. Like all nightjars, Common Nighthawks feed almost exclusively on insects, which they catch on the wing. Keep looking skyward once September arrives, and you’re likely to see one of these impressive migration flights of Common Nighthawks. I’ve seen flocks that would easily number more than 500 birds in locations ranging from Greeneville and Unicoi to Sycamore Shoals State Historic Park in Elizabethton. This entry was posted in Birding, Birds and tagged Bristol Herald Courier, Carter County Compass, Common Nighthawk, Elizabethton Star, Erwin Record, Nighjars, Whip-poor-will on August 25, 2014 by Bryan Stevens.